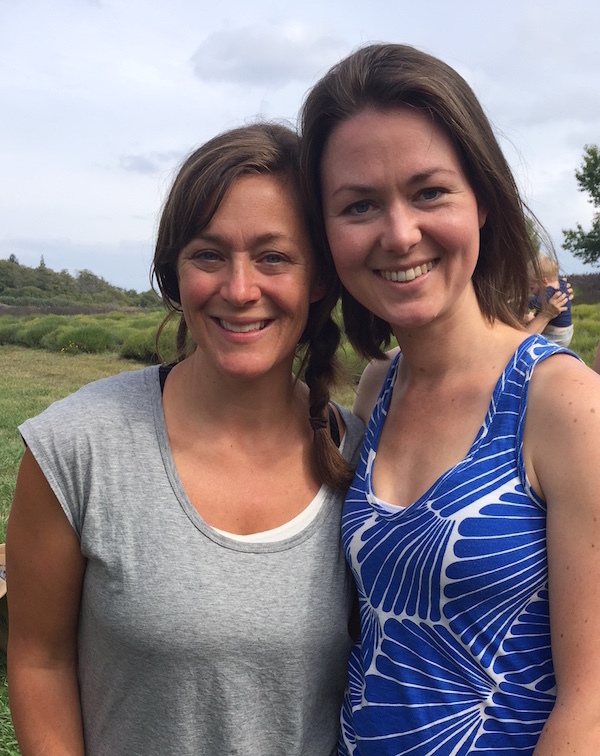 I had the pleasure of attending another movement retreat with Katy Bowman this past weekend (previous one was last year; here’s a recap of that experience). 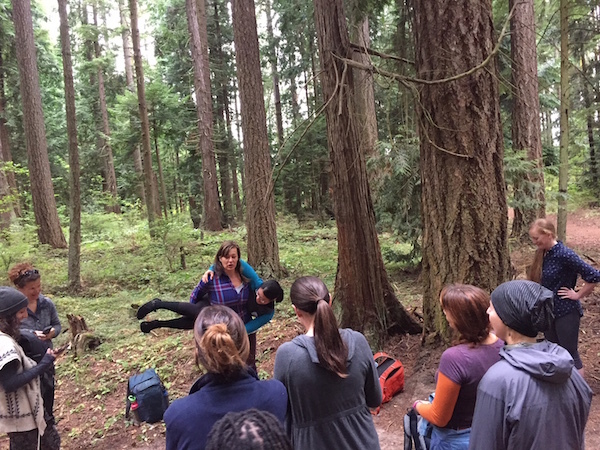 This program was focused specifically on pregnancy, called Movement Ecology During Pregnancy. I was lucky to get in; apparently there was a 200 person waiting list for this workshop! Most of us in attendance were in some way connected with the pregnancy/birth/postpartum space. I was the only dietitian in attendance, but there were a number of movement professionals (women’s health PTs, a women’s health chiropractor, yoga teachers, Pilates teachers, body workers, etc. ), doulas, midwives, lactation consultants, and many more. 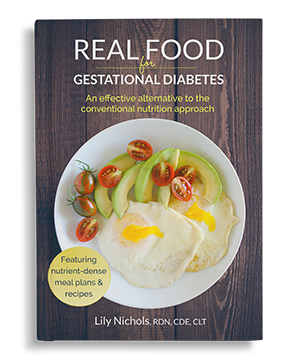 It was also cool to connect with people who knew my books as well (and hear all the positive outcomes from using real food with their clients!). 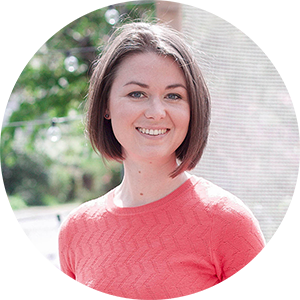 If you’re not familiar with Katy’s work, she is a biomechanist who takes a unique perspective on how our culture and sedentary lifestyle shape our bodies and our relationship with movement as a whole. Like so many others, I’ve followed her work for years and always appreciate the ancestral reframe on how our modern lifestyles have removed us from much of the physical labor that the human body is accustomed to (and needs) to function as intended. For a better understanding of her work and why she’s such a thought leader in the movement world, visit her website, listen to her podcast (Move Your DNA), and read one of her many books. Below are some notes I took during the workshop. 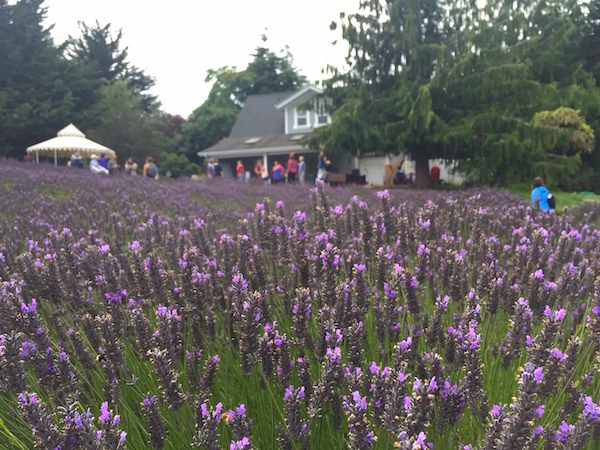 I didn’t have time to write everything down—the goal was to absorb and learn through movement, after all (and writing while on our Sunday walk or working at the lavender farm wasn’t exactly feasible! )—but I did want to share some key takeaways. 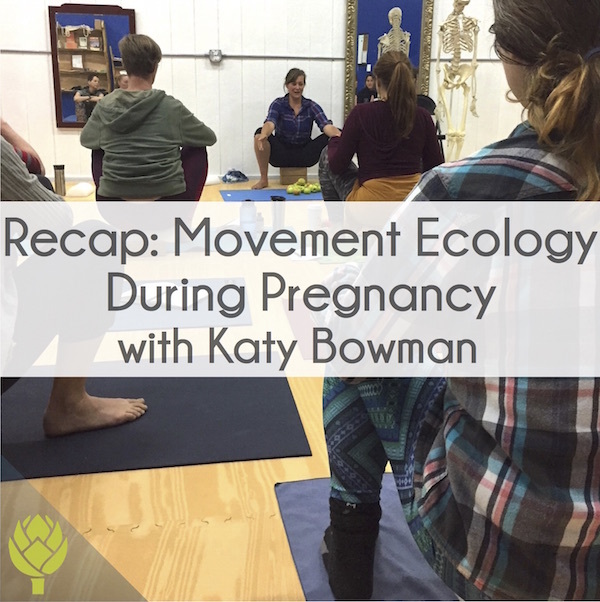 Here are a few takeaways from Movement Ecology During Pregnancy with Katy Bowman. 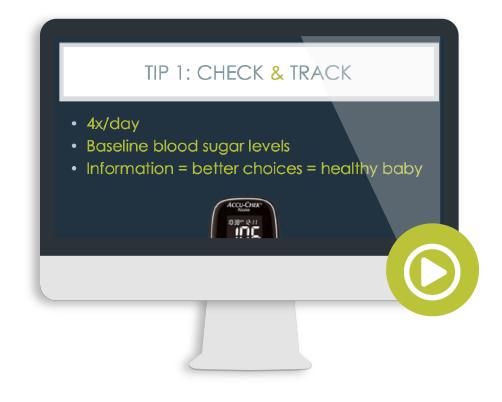 There are many different perspectives on pregnancy exercise and the type of information included (or left out) in various programs/guidelines depends on the perspective of the program/governing body who created them. 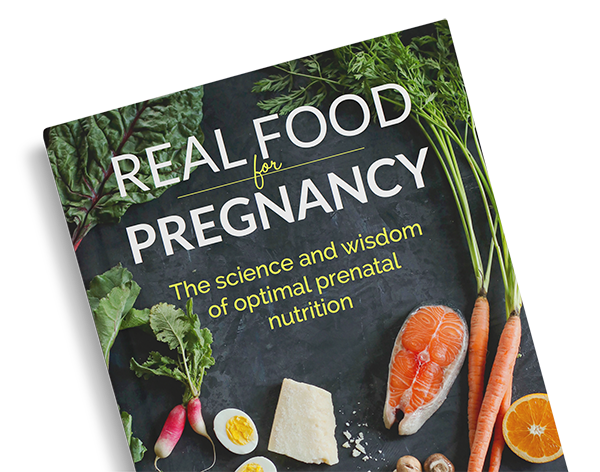 Is it to maintain fitness in pregnancy (ambiguous, by the way, since fitness is an inherently hard-to-define term/measure)? Is is to specifically attempt to optimize birth and delivery? One is not more correct than the other, it just affects the type of information and quality of information given. Misalignment of your bones and relying on your skeleton and connective tissue to hold you (rather than your muscles) is a major factor in many pregnancy discomforts (like SPD, diastasis recti, pelvic floor dysfunction, low back pain, etc.). 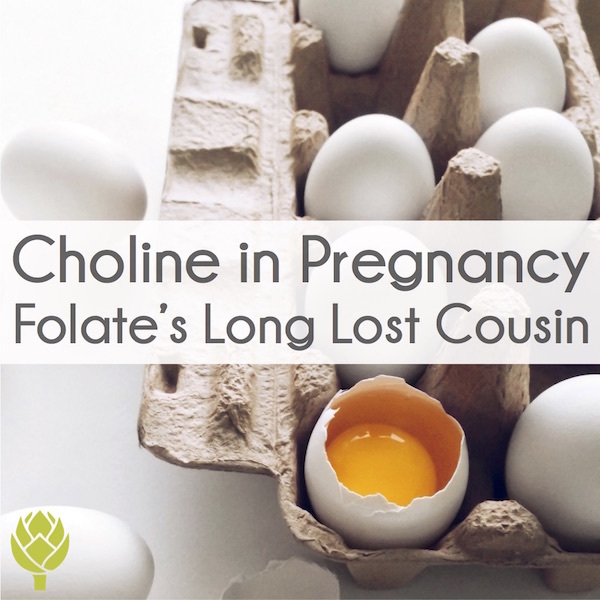 We shouldn’t blame pregnancy for this, rather pregnancy just reveals the “weak links” in our poor posture and movement habits as a whole with increasing mass and a shift in our center of gravity. Many people view exercise as an atonement for overeating. We need to ditch this entirely. Moving your body during pregnancy allows your baby to move more as well. All those kicks you feel is the baby literally exercising in utero or “fetal led movement” (it’s technically resistance training as they kick against the uterus). Yes, they are great for your body for many reasons (core strength, balance, hip mobility, pelvic floor health, all of which are helpful for birth prep). There isn’t a right or wrong way to squat, just different ways to do it based on your goals, such as working specific muscle groups. Birth is a natural phenomenon, but so is robust movement. Our sedentary culture is making this natural phenomenon more difficult if a woman doesn’t have the requisite strength, mobility, and stamina to have the option to choose the best position for her birth to progress. If you stop breathing during an exercise, it can be a sign that the exercise is at too great of a load and you’re relying on valsalva to stabilize. By not breathing, you’re not in alignment. You don’t have the strength to execute. Reassess the “why” behind the movement. My major takeaway from the weekend is that we probably shouldn’t view pregnancy movement any different than non-pregnancy movement. If you have a chance to attend any of Katy’s live events, I highly encourage you to sign up (no I’m not an affiliate or in any way tied to her programs; they’re just good!). As far as I know, the plan is to host this same even in Summer/Fall of 2019, so keep an eye on her event schedule. If that’s not a possibility, her podcast, books, and blog are fantastic as well. I focused this post on the broader implications of pregnancy movement, but it kind of leaves out all the fun stuff we did all weekend, which included a 7 mile walk along the Olympic Discovery Trail (and learning the best way to carry a friend who gets hurt in the backcountry), harvesting lavender and distilling lavender essential oil and hydrosol at an organic lavender farm, and many lovely real food meals spent with newfound friends/colleagues. 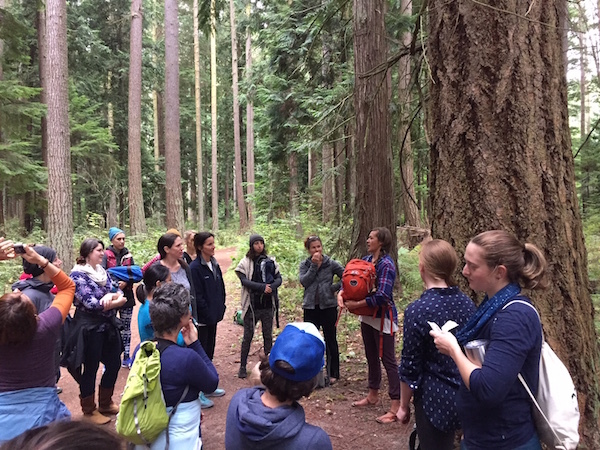 Below are some photos from the Movement Ecology During Pregnancy weekend. And in case you’re ever in the back country and someone breaks an ankle, here’s a good way to carry them out. 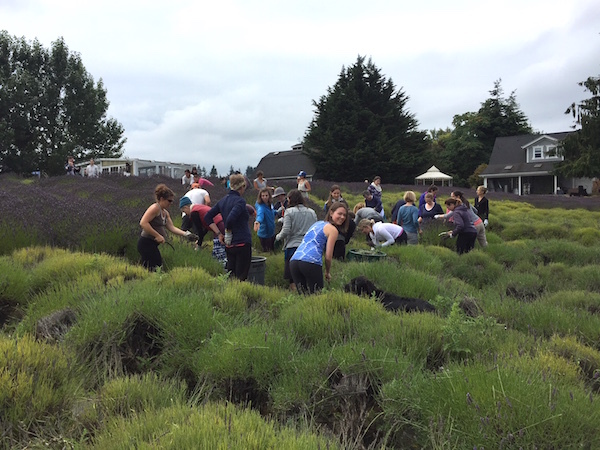 Harvesting lavender to distill lavender essential oil. Not only are we helping this family farm with necessary labor, but we can practice squatting, alignment, varying our stance in the process. 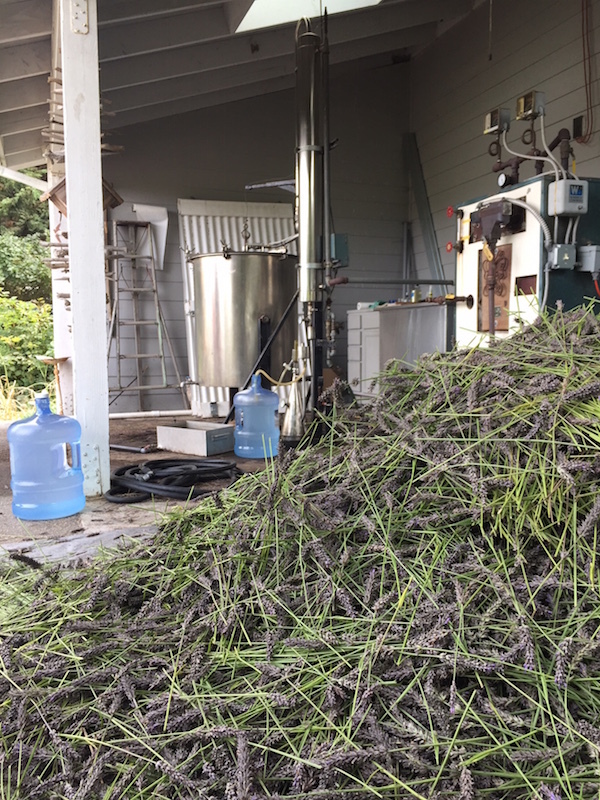 The massive pile of lavender awaiting processing while the still works on the first load. We bottled lavender hydrosol (lavender-infused water that’s a byproduct of the distillation process used to make essential oil). Lastly, this is NOT from this weekend. This was back when my son was 6 months old. I had listened to Katy’s podcast about carrying babies IN ARMS and found it helped my postpartum recovery. Here I am nearing the end of a 7 mile hike when my son wanted to nurse for the millionth time. 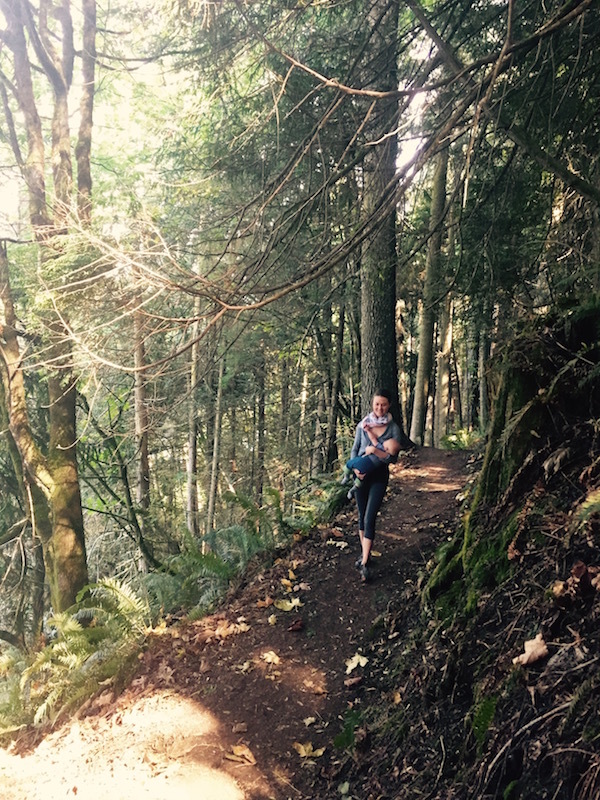 Instead of stopping to sit and delaying our hike longer, I hiked and nursed. This demonstrates the “stack your life” principle that Katy explains. 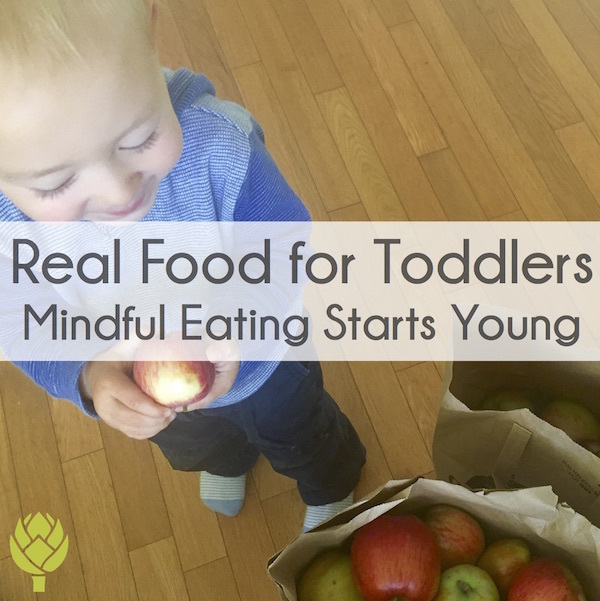 Movement is part of caring for a child, not something you need to do separately in a gym. Thank you Whitney! The link to the website has been fixed. Thanks for letting us know! This is great! 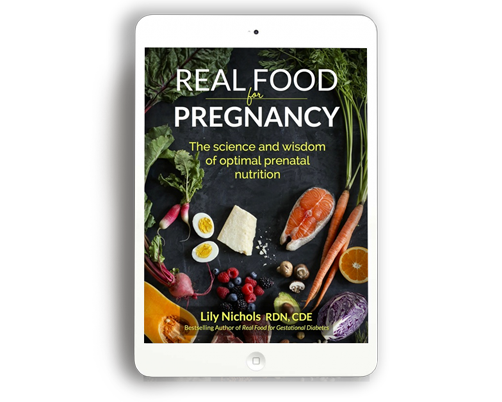 I am 36 weeks pregnant today with my first, and have kept your book and Katy’s books close by throughout! That’s great to hear, Holly. Sending ease-ful vibes your way for the last few weeks of pregnancy, birth, and postpartum recovery. I’m so glad to have read your distillation of Katy’s pregnancy workshop. I wanted to attend one myself, but haven’t had the chance. 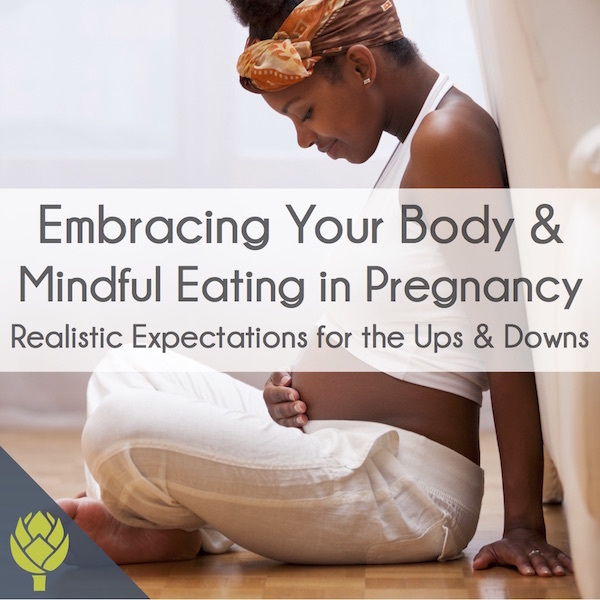 These principles are similar to what I teach in my prenatal & postpartum movement classes in Brooklyn, NY. As a pilates, yoga and embodied anatomy teacher, I know that the same alignment used for functional movement practices in the general population are even more necessary during pregnancy — as pregnancy simply highlights the weaknesses in our form, like you mentioned. 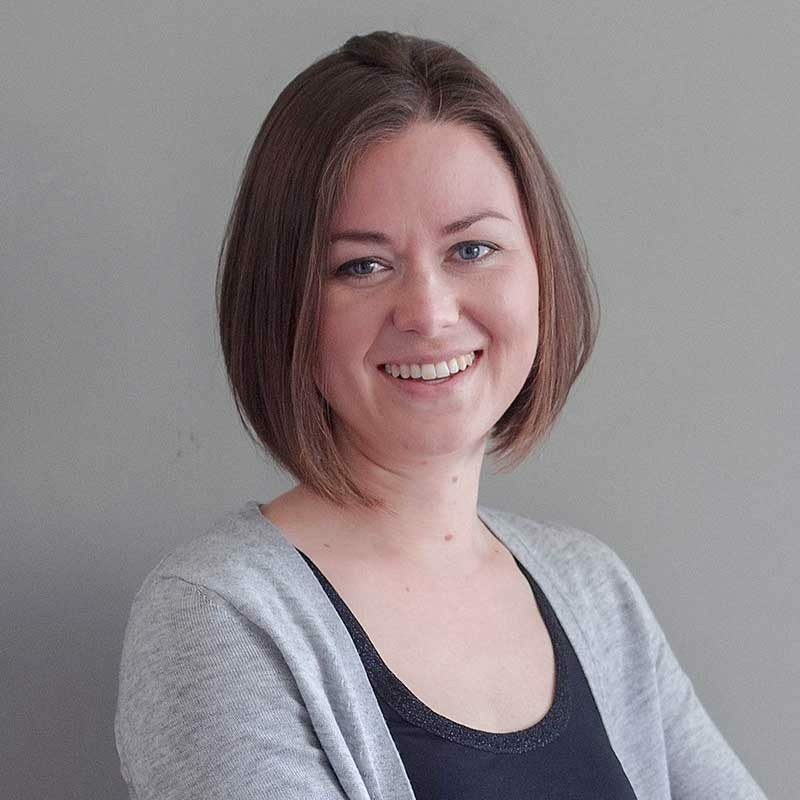 I am not always so lucky to receive students/clients during preconception, but when I do, their birth and postpartum experiences are relatively undramatic and easeful. Just as Katy talks about a build-in training program for pregnancy, my practice is to establish connection to the deep core (thanks pilates) through breath and visualization (thanks Body Mind Centering) and to them layer in movement (aka exercises or poses) that are centered, stable and integrated. I love what you brought up about nutrition re: collagen, etc. This is a blindspot in my practice that I’d love to know more about. One of my students sent me this post. I’m so glad to learn more about your work! It’s always optimal to work on all of these things (nutrition, movement, sleep, lifestyle), preconception, right? Then again, there’s never a wrong time to start integrating new-found knowledge. Your clients are lucky to have you! 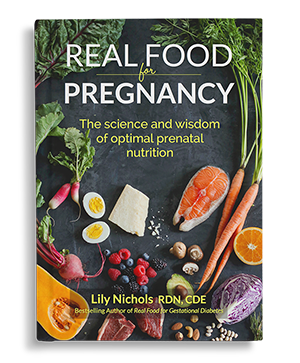 If you want to learn more about glycine and its role in prenatal/postpartum health and in fetal development, check out my book, Real Food for Pregnancy. 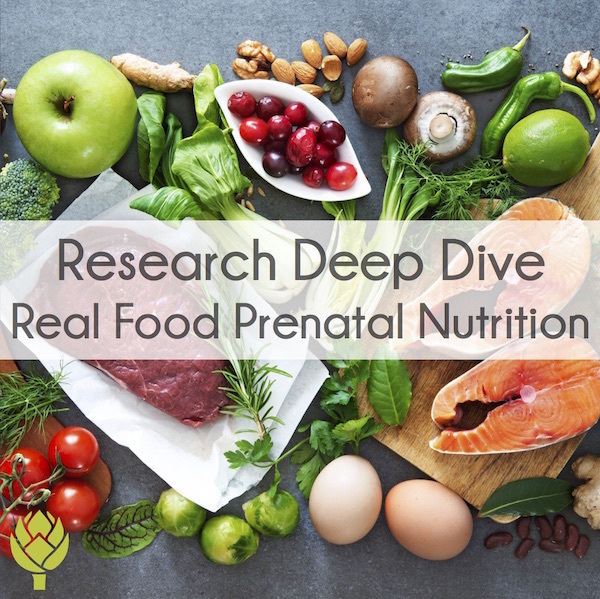 I include quite a bit of research on this topic because it’s completely overlooked by conventional prenatal nutrition guidelines. I’m taking the class this summer (August 2019) and I’m so excited! I love the photo of you walking and nursing, I do that with my LO too (she’s 10 months now).